Glenn Flood is truly Australia’s chef for all seasons – having worked in five star hotels, Michelin starred restaurants, corporate catering and then beside the greats on television with Jamie Oliver, Heston, Marco, René Redzepi, Masterchefs including Gary Mehigan and Thomas Keller, among others….. The list is long, and Glenn will tell you he’s only just getting started. It was 2007, and already based in Tasmania, I was visiting Melbourne and Glenn invited me to meet the crew and have a look at Fifteen. This was Jamie’s 4threstaurant tied in with the television show to give disadvantaged youth a hand up in life using cooking as the lever. Glenn had been whisked to London to meet Jamie before he took up the role as training & development chef on the show, and it was a smash hit. Of course. 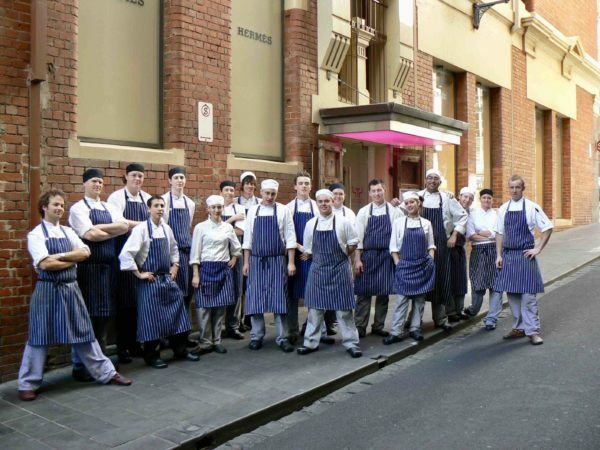 The restaurant, in a lane off Collins Street was the showcase where the kids worked in a real kitchen in real time. It had been a hugely exhausting gig, but Glenn thrives on pressure, and proudly showed me around and introduced me to the crew. I waited for him to finish, and we both caught a tram to his place to catch up with Niki and the kids, and enjoy swapping war stories and spend some time together. Ah the tram. As it clanged and clanked its way through Melbourne’s broad streets and heavy traffic, I noticed that a boy across from us was eyeing Glenn and whispering to his mother. Then further up the carriage, whispers and pointing floated at us, through the crowd. I nudged my friend. “Hey, I think they’re pointing at you, Floody. Feeling like a bit of a star?” I laughed. It was my turn to laugh. “My days of being a television star are long over, Mr. Flood. It’s you for sure.” And the young boy stood up as the tram stopped and the driver got out to change the rails. The boy grabbed the driver, and dragged him up to Glenn, with an excited and breathless, “Are you on Jamie’s Kitchen Australia? … With Jamie Oliver? Is that you,?” he was shaking. By this time, Glenn had to admit that yes, that was he, and the boy’s mother chimed in, rather embarrassed, “Oh, he’s desperate to be a chef ever since he watched that show!” The driver changed the rails and got back into the tram, only to clang the bell and announce to the whole carriage, “Ladies and gentlemen, we have a celebrity on board! A celebrity on board, who cooks with Jamie Oliver!” And the entire group of passengers applauded. Glenn went on to help recruit the Masterchef judges and be the show’s food producer, then to work his magic on Junior Masterchef. 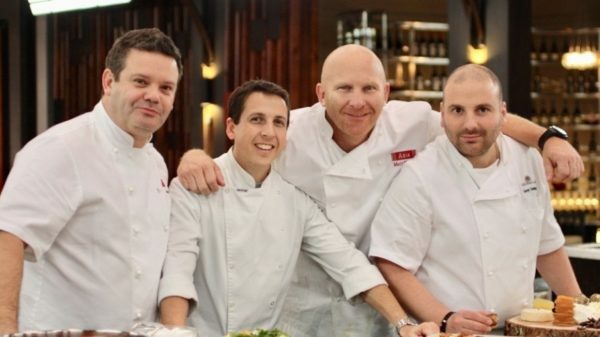 Masterchef greats: Matt, George, Marco, Glenn and Gary – who else? 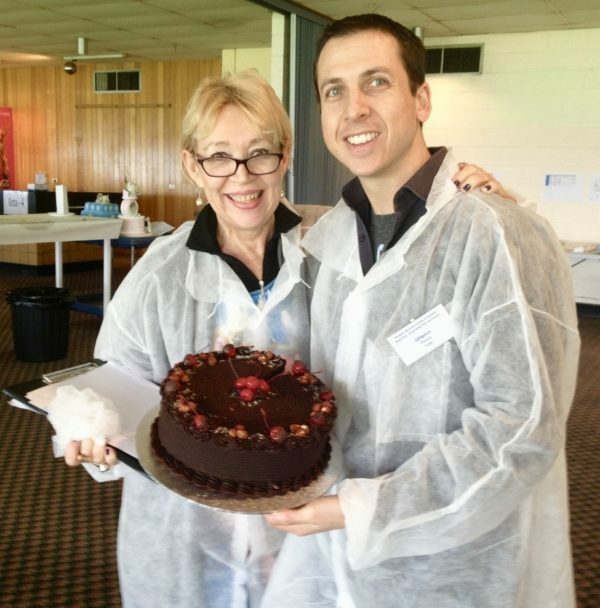 A few years later, as I’m doing a gig judging at the Hobart Royal Show Fine Food Awards, I suggest that we bring Glenn over as our guest celebrity judge. Why not? Was the answer, and we had two good seasons working together again, this time in Hobart, tasting and learning from other judges as well, because we both agree wholeheartedly, that as chefs, we never, ever stop learning. “It doesn’t matter what life throws at you, it’s how YOU deal with it that counts. We all have a choice in how we act, and I choose to see the positive in everything. Being positive is a choice – are you the victor or the victim? Am I going to act or react? I like to bring a level of positive energy to what I do. Daily I pause and reflect and have come to learn there are great lessons and opportunity for growth everywhere. If you practise it, (positivity) – it becomes an ingrained habit. That positivity has become my default – yet sometimes I’m too optimistic – sometimes I miss things because I haven’t considered the down side. I’d be terrible at risk management! (laughs) I think that being self-aware is important, as we all have our own personal journey, and if you stop to fully listen to colleagues perspective then it really develops your communication & leadership. As a savvy young man Glenn noticed that there were 3 pages of job ads for other industries combined, and 3 pages of ads for chefs. He nailed a job as a concierge in Sydney and began watching chefs running room service in the evening at the busy hotel where he began his career. The fast pace and team environment was intriguing to him, and he landed a job at Le Sandsin Brighton as an apprentice. What was that like? Glenn tells his story, “It was a huge operation, or so I thought at the time. There were 16 chefs, 8 apprentices, a stewarding team of 6, and they served functions, a fine dining restaurant and a café. I went straight into split shifts, beginning at 8am in pastry, then I’d run cold larder through lunch, for dinner the larder again and plate up for functions in a separate kitchen, then we’d scrub down the restaurant and function kitchens and head up to the café which pumped until 3am. After 12 months of Le Sands, I got itchy feet and headed to Perisher Blue for the snow. Snowboarding to be exact. And it was at Perisher that I worked in a huge production kitchen and being on the snowfields I saw the heavy social side of hospitality. That big kitchen did $70K – $80K a day in turnover, and we worked hard and played harder. Every spare minute I had was on my board out on the slopes. Like all resort staff, we were a team that worked and played together. But Sydney called and I headed to another huge venue, the St. George Leagues Club. I was young and had plenty of energy, and somehow managed to juggle 2 to 3 employers at any one time. The Leagues Club was a fantastic training ground, with 18 chefs, multiple function rooms, a la carte, bistro, auditorium, gaming lounge and all you can eat buffet. It was a gigantic beast, with its own pastry kitchen, and apprentices were rotated through each section. The Club was the first place I encountered females in the kitchen, a rare occurrence then (go figure! ), and they introduced me to competition cooking. The opportunity to push myself in a competition environment was amazing – I entered everything, as to me this is what training is all about. In 1995, as a 4thyear apprentice, I won the MLA (Meat and Livestock Australia) apprentice of the year. The first prize was a trip to the Salon Culinaire & Asia Pacific trade show in Singapore, that completely blew my mind & was a real eye opener. So I finished my qualification and headed to the Five star Cairns International Hotel. The German sous chef, Helmut, took me under his wing and taught me much in the fine dining restaurant. And then? Well, snowboarding and travel seemed to call, so I headed to Canada to do a couple of seasons on the ski fields. You know, I’ve found that if you’re passionate about what you do, it just doesn’t feel like work. I had about 100 days on the snow that year, and Canada has beautiful people with a different perspective on cuisine. It was a huge growth time for me. I discovered that cooking really could take me all over the world, while simultaneously building my skill set. Glenn continues, “I came back to St. George’s as Chef de Partie, catering for the board, the a la carte restaurant & VIP events. But with itchy feet again, I headed to the UK for a friend’s wedding, and my life as a chef just wound up several notches. Working at Harvey’s Restaurant in Bristol was a real eye opener. Daniel Galmiche was the chef, and the restaurant was housed in the original 13thCentury sherry cellar. The décor was by Sir Terence Conran, in 1961, and it had been a top destination for over 40 years. I went there thinking I knew how to cook, but you know what? I had to shelve all of that and begin again. They had a team of 8 chefs for a 75 cover restaurant. With 1 Michelin star, this was fine dining like I’d never seen before, and pretty soon I was hooked. The refinement, attention to detail and passion was next level. I was there to immerse myself, so even on a chef’s salary every 3 weeks or so we’d eat at a different Michelin starred restaurant. I first met Heston then, who also had 1 star, and Gordon Ramsay, who was a good friend of Daniel’s. I found the industry very tight knit and supportive, and enjoyed meeting the Roux Brothers at the Waterside Inn, and Michel Roux Jr at Le Gavroche. I saw a level of care and attention to food and all its nuances that resonated with me, and I resolved to keep that respect I had seen in these amazing kitchens. Back in Australia, I was running a corporate catering team of 20 chefs & cooks, specialising in bespoke events, board meetings & food logistics. When the opportunity came up to join Tobie Puttock & Jamie Oliver at Fifteen I jumped at the chance. It was mind blowing to work with such a young, authentic entrepreneur who’s changed the way customers view food. He (and Tobie’s) approach to food was refreshing – coming from a French style of refinement and process into a produce led cuisine, big on flavour where the food is served as it falls from the pan. 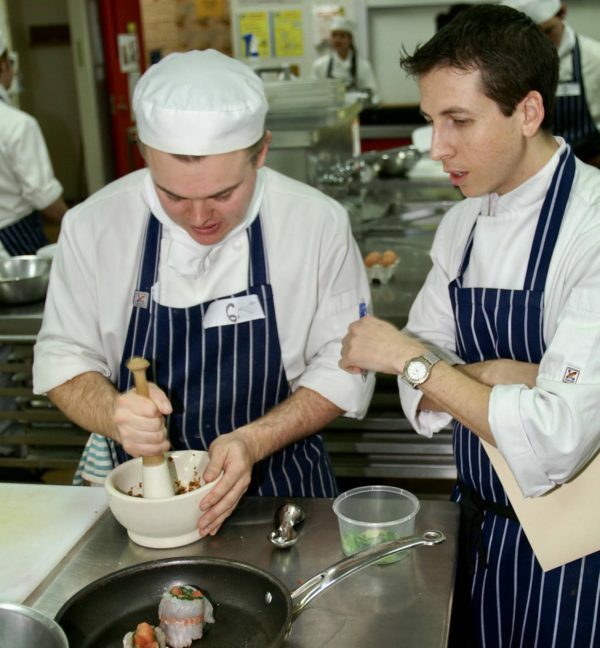 The Fifteen Foundation was unique in its approach to use the engagement of food preparation and service to successfully help young people overcome their troubled backgrounds. I learned we need to have a humble approach but with depth and meaning, because that’s the magic, the alchemy, utilising food to impact the kids on their journey… I’m still in touch with a number of the apprentices who were in the show and have gone on to forge their own pathways. For that opportunity I am forever grateful, I guess it was that exposure and training role that led me naturally to Master Chef. TAFE (where I’d been working with the 15 students) asked me if I’d assist with some dishes for a new TV series, and it turned out to be the actual audition process for the judges! I was the mock contestant and collaborated well with the production company, so it seemed a natural fit. Mind you, none of us knew just how big this show was going to be. Running the Masterchef development kitchen was an incredible role. 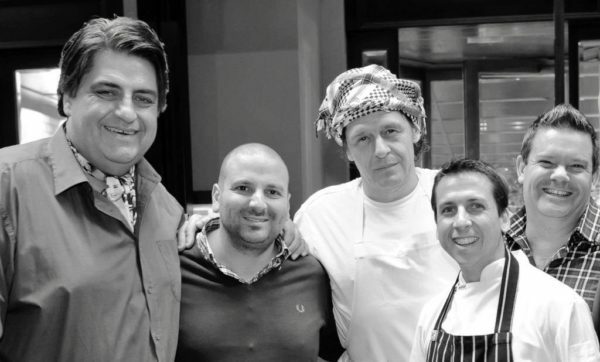 As a chef, to work alongside those I have respected for years – the likes of René Redzepi (Noma), Heston, Maggie Beer, Stephanie Alexander, Neil Perry, Curtis Stone, David Chang, Thomas Keller…and of course, Gary, George & Matt – just wow! To speak with them, understand their unique approach to hospitality… it was inspiring and mind-expanding to say the least. Masterchef has re-defined how customers view food & cooking in this country. Where am I going now? I’m in a very big self-reflection phase. I do have a wealth and breadth of knowledge that I just love to share, and I’ve done that in my strategic food management role with the largest caterer in the southern hemisphere and now with the largest hotel operator in the southern hemisphere. What do I enjoy right now? It’s best summed up in 2 words – impact and influence. How can I leverage my knowledge and vision to influence others to fuel their passion and support their own journey? I knowanything can be achieved if you’re open and willing to put in the work. Hospitality is a fluid and dynamic industry, with a multitude of pathways – it’s an exciting time and so many opportunities are presenting themselves that did not exist 5 years ago. But one thing that remains constant is being of service to your staff & customers….this act brings with it a feeling that is both humbling and rewarding, and to me is the essence of hospitality. And with those wise words, Glenn heads to another meeting, another opportunity, and another project to use his strength, positivity and leadership to give back to an industry that is so deep within him that there is no beginning and end of his being a chef. He simply is.